Another $50M will be invested in a healing foundation. Chief Marcia Brown Martel sings outside the Parliament buildings following a news conference announcing a compensation package for indigenous victims of the '60s Scoop on Oct. 6, 2017. OTTAWA — Survivors of a period in the 1960s that saw Indigenous children taken from their homes and placed with non-Indigenous families hope an agreement in principle with the federal government will put a stop to Aboriginal children being stolen from their language, culture and identity. Beaverhouse First Nation Chief Marcia Brown Martel, who was herself placed in the foster system as a child only to suffer emotional, physical and sexual abuse, said she has "great hope" now that a deal has been reached including $750 million in compensation for victims. In February, the Ontario Superior Court found the government liable for the harm caused by the '60s Scoop. Brown Martel was the representative plaintiff. "I have great hope that because we've reached this plateau that this again will never, ever happen in Canada again," Brown Martel said Friday as she stood beside Crown-Indigenous Affairs Minister Carolyn Bennett on Parliament Hill for the announcement on the settlement deal. 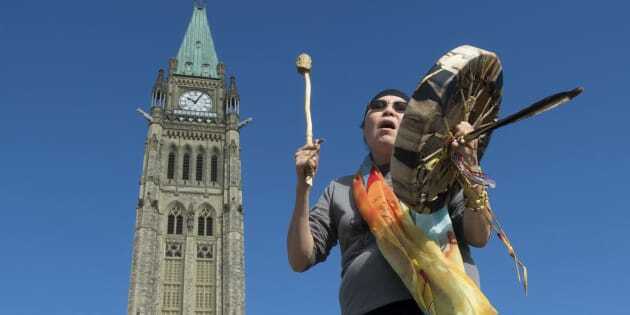 At the same time, she warned, Indigenous children are still subject to the "millennium scoop." "They call it 'in care' but it adds a risk factor for them. Therefore, one must stop using that term ... they're not in care. They're away from their communities ... our children need to come home." Bennett fought back tears Friday as she announced details of the deal with Brown Martel and other survivors — a package that also includes up to $50 million for a foundation for healing and reconciliation. The federal government has also earmarked $75 million for legal fees. The compensation money will go to individuals classified as status Indians and Inuit. The '60s Scoop a dark and painful chapter in Canada's history, Bennett said. "Their stories are heartbreaking," Bennett said. "They talked of their identity being stolen. They talked about not really feeling that you belong anywhere because people have been moved so often or that they didn't really have a home." Too many Indigenous children are still being taken from their families, she added, insisting Ottawa must change the current design of the system to ensure funding goes toward children, family and communities rather than lawyers, agencies and non-Indigenous foster families. Surrounded by Chief Marcia Brown Martel and '60s Scoop survivors, Crown-Indigenous Relations and Rorthern Affairs Minister Carolyn Bennett responds to a question during a news conference on Parliament Hill on Oct. 6, 2017. "We want that overhaul to happen so that we a system of the rights and well-being of Indigenous children and youth to be raised in their language and culture and not have this harm done that was done to these courageous people," she said. The agreement is a "first step" in resolving '60s Scoop litigation, Bennett added, noting the federal government is committed to working with other Indigenous Peoples affected. The provinces and territories are also working on resolving remaining litigation, she said, adding individual compensation will be determined among legal counsel. The agreement in principle announced by the government is less than the $1.3 billion Brown Martel sought for victims of the Ontario Scoop in which at-risk on-reserve Indigenous children were placed in non-Aboriginal homes from 1965 to 1984 under terms of a federal-provincial agreement. In a class action started in 2009, Brown Martel maintained the government had been negligent in protecting her and about 16,000 other on-reserve children from the lasting harm suffered from being alienated from their heritage. Jeffery Wilson, one of her lawyers, said previously the class action was the first anywhere to recognize the importance of a person's cultural heritage and the individual harm caused when it is lost.